HISTORY: An aerophone named after the Greek Muse Calliope who presided over poetry, song, and the arts and sciences. 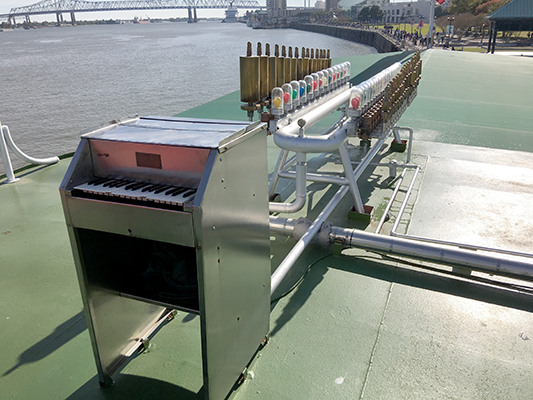 Also known as a steam organ, steam piano, or calliaphone (air driven). The Reverend James Birkett of Ovinsham, England invented, what he called, a steam organ in June of 1838. It was attached to a locomotive from the Newcastle and Carlisle Railway Company and was to be played at a railway grand opening. The instrument consisted of eight pipes and covered an octave without semitones. This invention was never patented. A few years later in the 1840s, Joshua C. Stoddard began working on the steam powered calliope and went through several versions before introducing it to the public. The first instrument consisted of 15 whistles, of graduated sizes, attached in a row to the top of a small steam boiler. A long metal roller that ran the length of the boiler was outfitted with pins, similar to a music box. 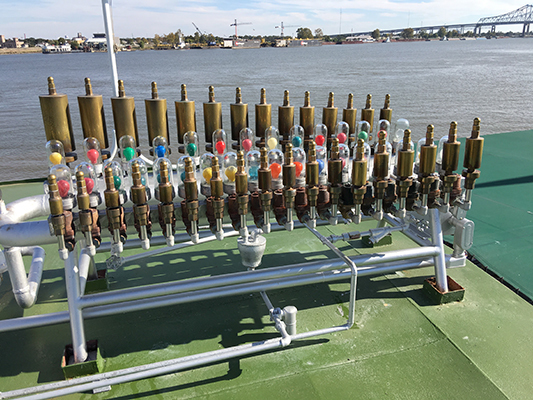 The pins were arranged to press the valves and blow the whistles in proper sequence as the roller turned. Stoddard later attached wires to the valves and connected them to the keys of a keyboard so the instrument could be played like a piano. The first performance of the keyboard version took place on July 4, 1855 on Worcester Common. Stoddard patented the calliope in October of the same year. With the positive public reaction to the calliope, Stoddard founded the American Steam Piano Company. After five years, his lack of business acumen drove his financial backers to remove him from the company, and Henry A. Deny, became president of the company and claimed that he owned the invention. Under the new management, became popular. The mid to late 19th century was a high point for steam power, and steam was readily available at venues such as river steamships (for propulsion), amusement parks (for electrical power), carousels (for propulsion), and circuses (for electrical power). That made calliopes an effective marketing tool for these venues all over the country. Although the use of steam power has long since died away, air-operated versions of the calliope are still found in circuses and carousels today. Thomas J. Nichol was the best-known calliope builder, with a reputation for building the best quality and best sounding instruments. He built over 90 instruments in his career. After his death in 1924, his sons took over the business and eventually sold the patterns and molds to J. M. Van Splunter. Splunter continued building and refitting existing instruments until the early 1960’s for many clients both river and circus related. Compressed air eventually began to replace steam as the vehicle of producing sound. In 1905, Joseph Ori developed the first practical air calliope, and by 1912, had started a company to hand build these instruments. A few years later, Norman Baker established a company to mass produce his model of air calliope (calliaphone) in Muscatine, Iowa. He produced his Tangley Calliaphone from 1914 to 1931. Most calliopes disappeared in the mid-20th century, as steam power was replaced with other power sources. Without the demand for technicians that mines and railroads supplied, no support was available to keep boilers running. Only a few steam powered calliopes have survived, and with a few exceptions, these are rarely played. PHYSICAL DESCRIPTION: Stoddard’s original calliope had 15 whistles but grew to 18, 21, 24, 28 and ultimately, the standard settled on a 32-whistle instrument. One of the largest calliopes has 67 whistles. The whistles are lined up, in size order, on two sides of a “U” shaped pipe that supplies the steam. Some calliopes (like the example shown) have synchronized colored lights that light each time a note is struck. This is solely for visual effect. The keyboard is small in comparison to other keyboard instruments, due to the 32 keys as opposed to the 88 keys of a modern piano. The keyboards in many steam instruments were often made from brass. The brass stood up to the heat and moisture of the steam, but also provided a wonderful luster with polished keys. The early calliope had a mechanical operation with a cylinder, similar to the cylinder on a music box. The later instruments employed a keyboard, however, there were instruments that used both a keyboard and a mechanism for automated operation. 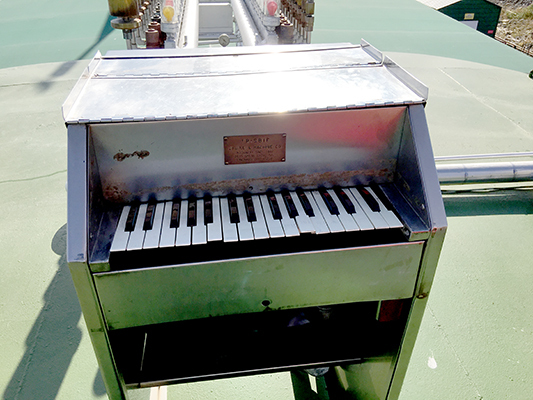 There are also modern versions of the calliope that can be played through a MIDI interface. Sound is produces by sending the steam (or in many newer calliopes, compressed air) through large whistles. These whistles were originally designed as locomotive whistles, but refined over the years to produce accurate pitches. The whistles are tuned to a chromatic scale as in most other keyboard instruments. The sound is produced when the steam is forced into the top part of the whistle (the bell) which is a tube closed at the top. The whistles with the larger bells produce the low pitches and the smaller bells produce the high pitches. SOUND PROPERTIES: The calliope has a harsh sound that can be heard for long distances, up to several miles in some instances. Since the steam is a constant pressure, and the parts of the whistle work the same way each time, it is impossible to provide any variance to tone or dynamic contrast. With the many outside influences on the physical parts of the calliope, it is near impossible to keep all of the whistles perfectly in tune. Between the temperature of the steam and any weather influences, tuning is always a challenge. Rather than being a detriment to the instrument, it has actually become a trademark of the instrument. Part of the allure of the calliope is the slightly off-pitch notes, particularly in the upper register. RANGE: The standard steam calliope has a 32-note range starting at C3 and ending at G5.